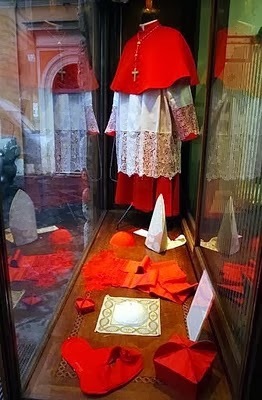 With nary a leak on the timing, at the Noon Angelus on this feast of the Baptism of the Lord Pope Francis unveiled the biglietto of 19 prelates – 16 electors, three "honorary" picks over age 80 – to whom he'll give the red hat at his first Consistory on February 22nd. As expected, the list is topped by four Curialists – with, in a significant shift, the head of the newly-enhanced Synod of Bishops, Cardinal-designate Lorenzo Baldisseri, outranking the prefect of the CDF, Cardinal-designate Gerhard Ludwig Müller – but the big story is the likewise-foreseen predominance of names not just from well outside the Vatican, but considerably off the traditional path of membership in the papal "Senate," including the first-ever cardinals from Haiti, the outer Caribbean and the Philippines' majority-Muslim island of Mindanao... and with them, the heads of only two European sees. In another notable feature of the slate, for the first time since Blessed John Paul's first class in 1979, no US prelate has made the cut, but that's little surprise – as previously noted, the Stateside church's traditional complement of cardinals is fully topped up, with none of the 11 electors from these shores set to turn 80 until 2015. That said, the lone North American to get the call – Cardinal-designate Gérald Cyprien Lacroix of Quebec – spent the bulk of his formative years in New Hampshire, graduating from Manchester's Trinity High School and St Anselm's College before a meteoric rise that, at 53, saw him launched into the helm of the oldest diocese north of the Rio Grande. For the Italian church, meanwhile, as reports in Rome have tipped for days, Papa Bergoglio has touched off yet another earthquake by passing over the heads of the historic "cardinalatial sees" of Venice and Turin both, elevating in their stead Archbishop Gualtiero Bassetti, 72 – a figure said to more faithfully reflect Francis' identikit of a shepherd with the "smell of the sheep." One of the three regional vice-presidents of the Italian bishops conference, Bassetti becomes the first archbishop of Perugia to enter the College since the late 19th century. 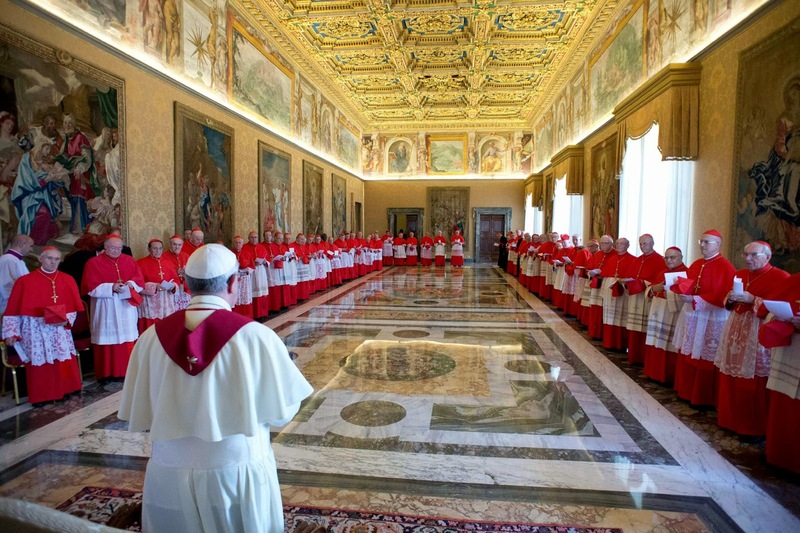 While Francis didn't significantly deviate from the customary maximum of 120 electors – with the new intake, there'll be 122 on Consistory Day – for practical purposes the limit established by Paul VI will remain intact. For one, the disgraced Scottish Cardinal Keith O'Brien, 75, who resigned as archbishop of St Andrews and Edinburgh and vanished into exile after admitting charges of sexual misconduct on the eve of the March Conclave, is not expected to take part in another papal election should one occur before he reaches the age of ineligibility, and the Indonesian Cardinal Julius Riyadi Darmaatmadja of Jakarta, 79 – like Francis, a Jesuit – was likewise kept from the last election, in his case due to chronic ill health. Among the "emeritus" selections over 80, the most-prominent figure is the venerable priest-secretary of Blessed John XXIII, now Cardinal-designate Loris Capovilla, who'll see his boss canonized by Francis on 27 April before turning 99 in October. In making the announcement, Francis confirmed that – as previously noted, and continuing the tradition begun by his predecessor – a two-day consultation will be held with the entire College on 20-21 February. For the second time in two weeks, in light of October's Extraordinary Synod on the topic, "the theme of the family" was the only subject the Pope indicated for the discussions, but others are likely to arise. The new cardinals will concelebrate Mass with the Pope on the 23rd. 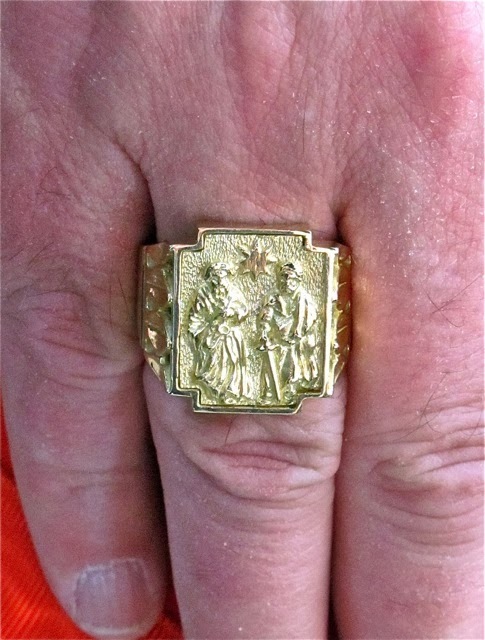 While that rite used to be the "Mass of the Rings," a revision of the rites at the Consistory of February 2012 moved the conferral of the redesigned gold band (left) right alongside the giving of the red hat itself.